Of course I really like Christmas. It’s the Most Wonderful Time of the Year – right? It is all about the decorating, the baking, the holiday movies, all the parties and good cheer, but what I really LOVE about the holidays – is the music. Christmas would not be Christmas without the music. I love all kinds – popular, contemporary, instrumental, and the old crooners, too – Andy, Dean, Nat, and Bing. I even change my cell phone ringtone to play something festive in December. Just imagine not hearing… jing-a-ling-jing-jing-a-ling, just hear those sleigh bells jingling… ringting tingaling, too…while you are rolling out your cookie dough. Draping garland on your staircase in silence…need I say more? Music is a major factor in creating the mood. We need inspiring stimulus for all of our senses, not just our eyes. I have officially declared Nov 18th the official – I can play Christmas music in my house without any flack from anyone saying to me “it’s not even Thanksgiving yet”. I have acquired quite a collection of CD’s and buy a new one every year. This year I would like to share with you one that will make you smile. I just bought it at Target and I am sure you can download it on iTunes. My daughters who are 23 and 19 introduced my husband and me into the world of College Acapella. Each of their colleges had groups and we always tried to visit them when there was a concert scheduled. They were all highly entertaining. Straight No Chaser is the Indiana University Acapella group you may have seen singing their version of The Twelve Days of Christmas. Check them out on this YouTube Video. 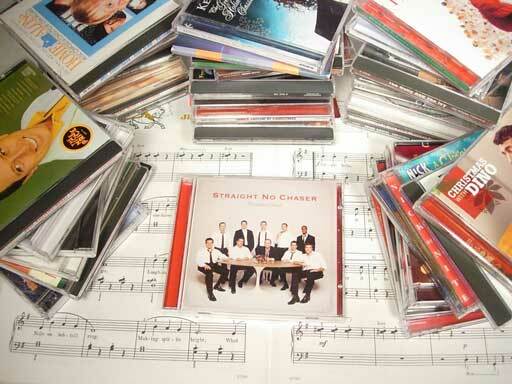 They now have a CD – Christmas Cheers. It is a mix of traditional, popular, and downright finger-snapping songs all sung acapella by 10 guys. You will swear there is instrumental accompaniment with them, but all the sounds come only from their voices. Some of the sound effects they come up with are amazing. What songs make your Christmas special? One of my favorite Christmas songs is The Little Drummer Boy. Sung by Bing Crosby and David Bowie. They sound wonderful and have a little conversation in the song that just is sweet and makes me smile. Love that one too Nancy. It is on one of the CD’s I have. They do sound wonderful together while bringing two generations together. Hi Diane, My favorite is the soundtrack to the first Home Alone. It’s my Christmas wrapping music. I also love Charlie Brown’s Christmas and Johnnie Mathis.